President Obama was elected in 2008 and went on to serve two terms, beating out Mitt Romney in the 2012 election. In the 2016 election, Hilary Clinton ran against Donald Trump. Hilary Clinton, President Bill Clinton’s wife, had a long history of political experience. She had served as Secretary of State and a Senator for New York State. But, many people had not forgotten the moral and ethical scandals of her husband’s presidency. Hilary Clinton had her own political scandals and alienated many people with her hardline approach to abortion, gun control, and other controversial issues. Donald Trump emerged as the Republican candidate, although many Republicans disliked him. He had no political experience and was a businessman of questionable moral and ethical character. The entire country, including most Republicans, was surprised when he won the 2016 election. During the 2016 election, the Republican Party lacked unity and organization. Never before had Republicans across the country been so divided. Some ultra-conservatives favored strict immigration laws and wanted to get rid of universal health care. Other Republicans favored a more moderate approach. Many Republicans disliked Trump’s tough talk and seeming lack of compassion and restraint. Mormons, who generally voted Republican, were among his strongest critics. Many Mormons and other Republicans refused to vote or voted for third party candidates. The election was one of the nastiest in recent years. Friends and family members had heated discussions about which candidate to vote for. People got into debates on Facebook. Most people assumed Hillary Clinton would win. The country was surprised and shocked as the results came in. Donald Trump had won the election. In the weeks after Trump’s election, Democrats were scared and saddened. They wondered what would happen next. Question: What will Donald Trump’s legacy be? Answer: It’s too soon to say at the time of this writing. He has reversed many of Obama Barack’s environmental regulations and is talking about building a wall between Mexico and the U.S. to reduce the problem of illegal immigration. His attempts to ban immigrants from Muslim countries from coming to the U.S. have been highly controversial. Visit Wikipedia to learn more about Donald Trump. Declan, Tobin. " Facts for Kids about Donald Trump ." American History for Kids, Apr 2019. Web. 22 Apr 2019. 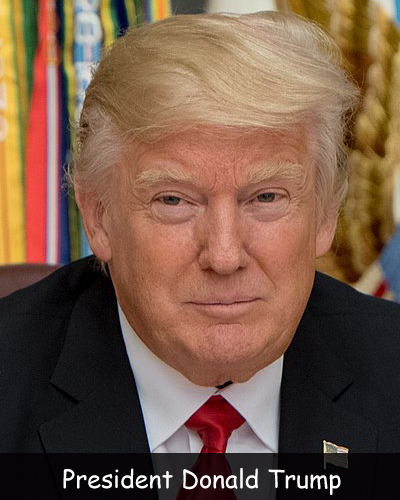 < https://www.americanhistoryforkids.com/donald-trump-becomes-president/ >.